Behind this virtual door, is the give away prize. I hope you are paying attention because I really wouldn’t want to see you miss out. This process has been delayed by a day or so which is why you are seeing blu door #2 and not meeting the prize piece just yet. Considering all of this uploading is happening from Jamaica, a day late is quite reasonable. If you’ve been here, you know. Thank you for being patient. And I assure you it will be well worth the wait. 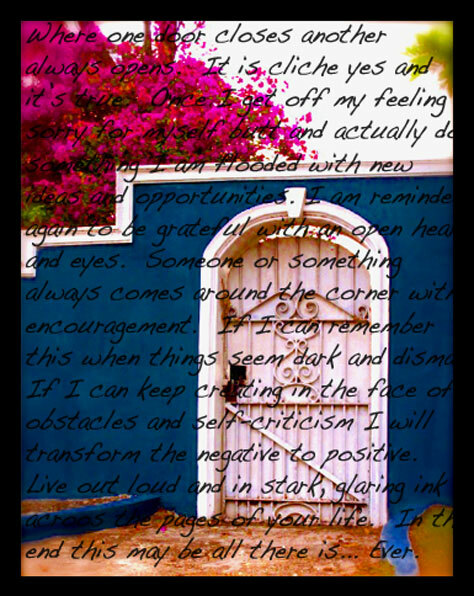 What calls to your creative side when you open the door (this can be literal or figurative)? I plead with you to stop saying that “you don’t have a creative side” or that you are “not very creative”. We are all blessed with something spectacular and extraordinary, whether we have “a good eye” for design, in photography, art, fashion or are able to do something crafty with our hands, sometimes it is our prowess of listening or speaking that shines. Maybe you mix beats or make music mixes, plant flowers in your garden, write the best travel postcards ever, make the most amazing Italian food or rock the theatrical game of charades while dancing to Vivaldi. Whatever it may be, there is some creative ability that you are either unaware of or hiding from the world because you don’t think of it as creative. Open your minds eye, and look at your environment in a new way. What speaks to you or looks the brightest, what do you notice again and again? Open your door and create or share creatively. I would love to hear/read about whatever it is that moves you. C’mon now, give us whatcha got! Just a quick one today. As internet is kinda in and out up on the hill. Postponed by the weather. Thought I’d post the rules again as we have a few new comers. Introducing: Miss. OFaux. 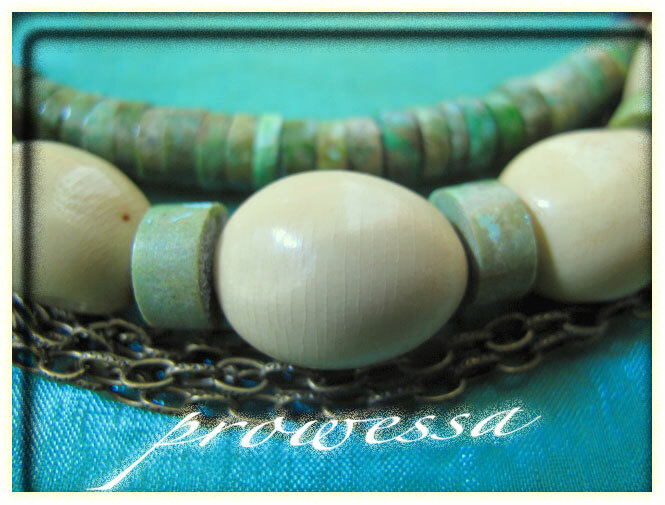 Collection: Sand Stone Sea Sky;from the rock, species: necklace. 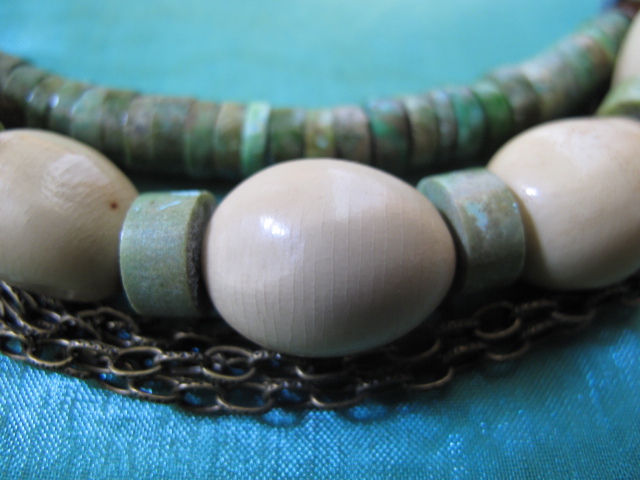 Naturally Dyed, hand drilled, wood O’s, adorned and attached with a vintage faux pearl. Dangles from 18 in. chain. Super comfortable in the everyday and elevates easily to dress up. Utilitarian, yet sweet and feminine. This contemporary, vintage, pretty promises to fit the bill. The subtle blu blends with a variety of pallets and is known to be a calming shade.She’s still available. Subscribe to somethingblu.wordpress.com (sign up box can be found in the right) hand sidebar. Pay attention to posts and look for the final give away post. You will recognize this post because: The post title that day will include the words: Final Post. Comment on the Final Post picture. The Final Post will include a picture of the give away prize. 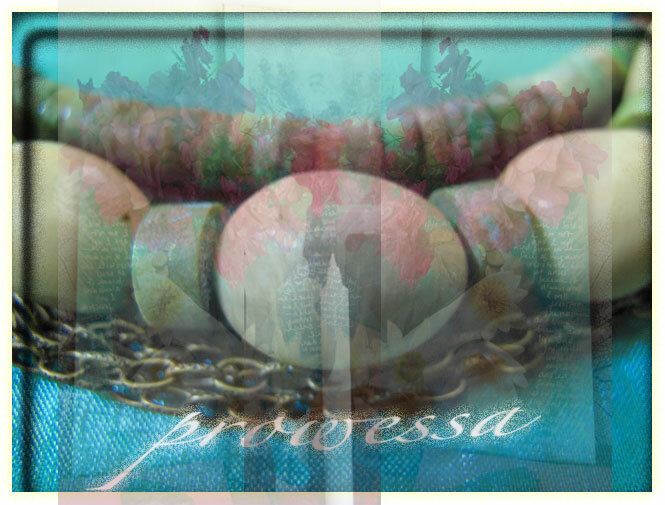 You must comment on the jewelry featured in the Final Post to be entered in the give away drawing. 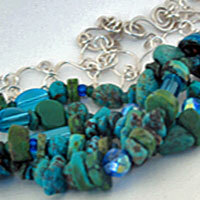 You will have three full days to comment when the Final Post jewelry picture is posted. Wait, pay attention & hope that your name is posted as the winner!!! Okay, Okay, It’s been awhile I know, ahem, tail between legs etc. 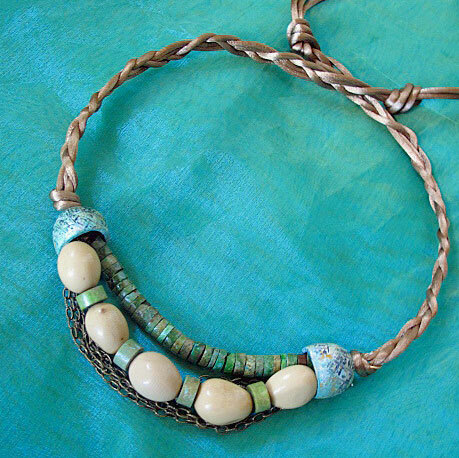 I thought I would come back to you rejoicing and beaming with the amazing success that was the debut of Sand Stone Sea Sky, from the rock, ila blu, 2010 jewelry collection (a wonderful show). Almost two weeks out from the show what I can say, is that I have been incredibly busy. Ultimately, this is a good thing for the biz, not necessarily for the blog. I know, more than likely, you are busy too, only you didn’t commit to writing this blog and/or hosting a jewelry give away here. So the next few posts will be a lead up to the promised give away. I will post some pics and leave it to you to comment. It’s a good thing to get in the habit of commenting on the next few posts as the final post will be a birds eye view of the piece intended as the prize. 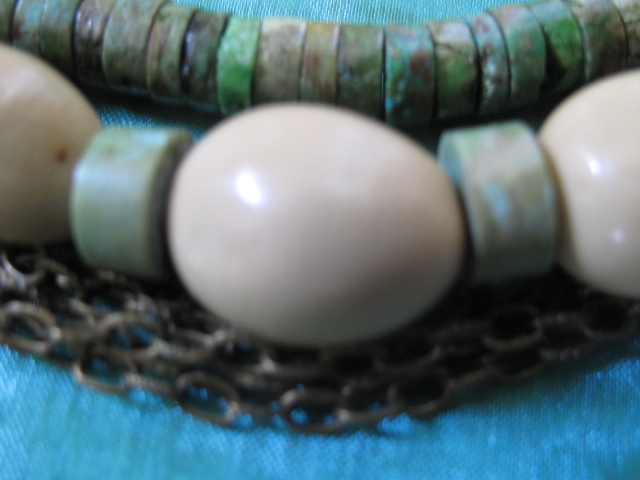 And you will have to post a comment on that picture/piece of jewelry to be entered in the drawing to win. Now that you are subscribed to this blog (i.e., you are receiving an email re: this post) you are eligible to participate in the give away. If you are not yet subscribed, go to the right sidebar of this blog to the subscribe box/widget and sign up. You must be subscribed to enter. And YOU MUST, I repeat, you must, leave a comment about the final, birds eye view, picture of the intended prize. Once I post that picture/post I will allow 3 days for comments to stream in. I hope to see comments from all of my subscribers, and I do know how many of you are out there. 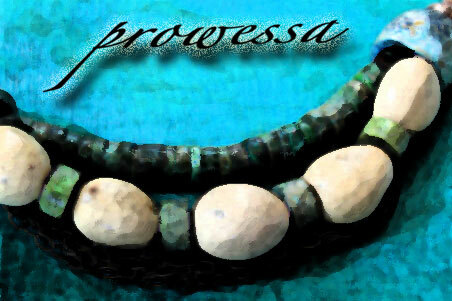 So if you are in it to win it comment on the jewelry piece in the final post. The post title that day will include the words: final post. Just to make it clear. I will post some portion of this current post again for those who might not have seen it, accidentally erased it or have had their email accounts hijacked, which apparently, has recently happened to my cousin. 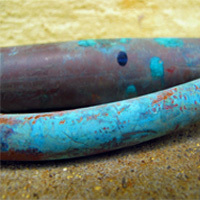 In a couple of days I will post a detailed list of said parameters for the something blu jewelry give away. This whole process will take place over the course of a week plus a few days. In the meanwhile, I would love some feedback, re: some blog decisions that I have to make. 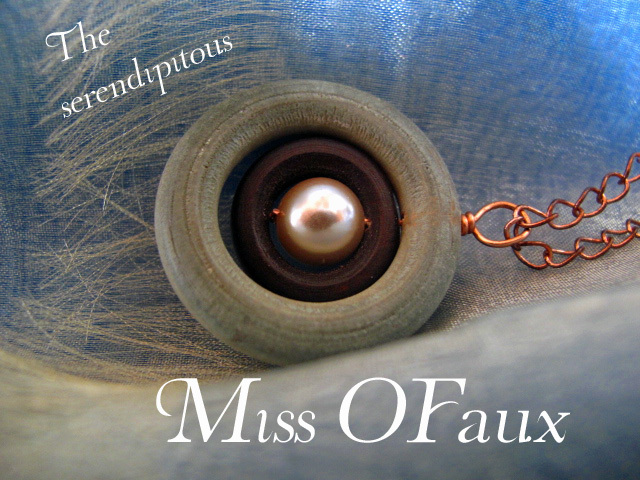 It has been brought to my attention that changing the name/and or location/ theme of my blog to better resonate with the name of my jewelry biz is probably a very good idea. I wonder how you all feel about this and if you would still visit and or become a member at yet another blog space? Your opinion counts. 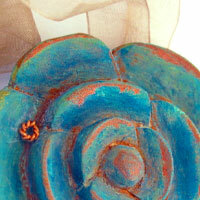 I am not sure if I should start a studio blog that would continue to incorporate my jewelry and mixed media work. Or move this blog to my website, ilablu.com (just to keep it streamlined), or start a new one there? You can see how I am overwhelmed by the options. 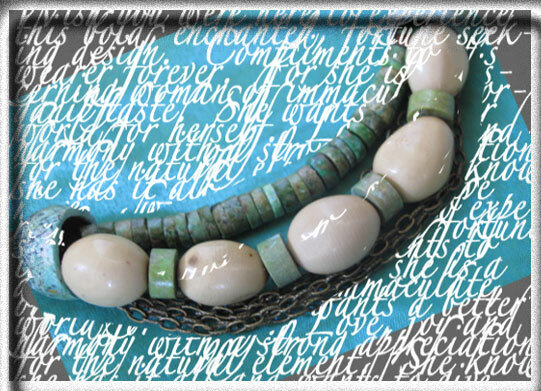 When I started this blog I was not so sure about the goals I had for my jewelry and art. I also had no clue what I was doing. And I know a little more now. It seems smart to keep everything simple. So that all digital stuff links easily and my work, (shop, site, blog) is easy to find, etc… Please let me know your thoughts on this as they will affect my decision as to how I move forward with this project. One love, and I hope your busy is good. I have indeed neglected my loyal subscribers. I assure you, you are not forgotten. But tucked safely away in my heart and conscience reminding me always to keep creating and keep on posting. I am at last, getting my blog on. Thanks to a little help from my friends and family… Mainly, my King, (husband,etc). Once again he has risen beyond the call of duty to assist me in pulling off the upcoming ila show in San Diego California. Now, if I can learn to balance said preparations while sustaining my digital life, we should have a pretty good show!!! Introducing: Blu Ceru. A one of a kind blu beauty. Although I have made a few of her species, no two are identical. The organic nature of this ring attracts a special kind of attention. Once you don her on a finger, or suspended from a chain close to your heart, you won’t leave home with out her! 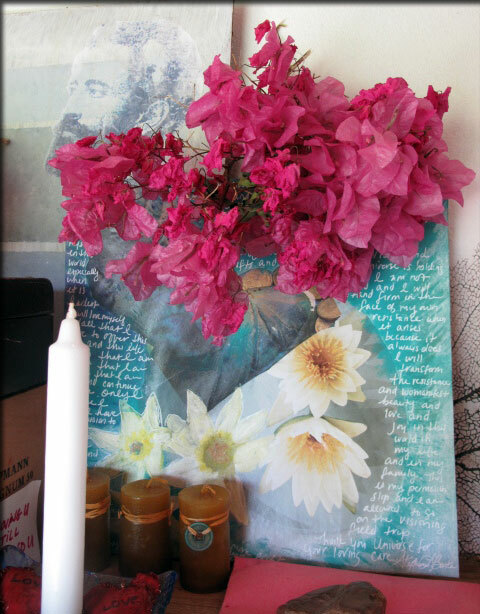 In fact, the original, great, great grandmother Ceru Blu (featured above), still resides in my personal collection. What can I say? It was love at first sight! No jewelry lover’s reservoir is complete without a Blu Ceru. Known to ward off negative vibes and arthritis, this blu, fire polished, czech glass, copper ring is worth her weight in gold! Fortunately, for you, she is available at a fraction of the price. 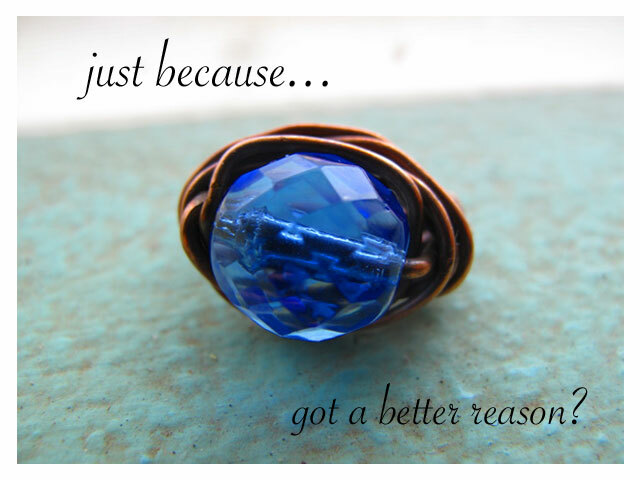 As a reminder, if you are in it to win it (no, sorry not the ring, but an equally fabulous piece of unique jewelry, handcrafted in Jamaica, by moi), SIGN UP HERE, at something blu, or you will not be eligible. Stay tuned for announcements re: the give away etc… Have a beautiful day. As cliche as it may be, it’s true. Where one door closes another opens. The door has closed on the life of our beautiful friend Cree. I have been kickin’ around the house in denial and the last dregs of grief. Left the house only once this week, dressed in black, of course, and with very large sunglasses to cover the tired, sadness in my eyes. Not wanting to see or talk to anybody. Maybe you noticed, I couldn’t even post. Nonetheless, to my surprise, the world was waiting for me. 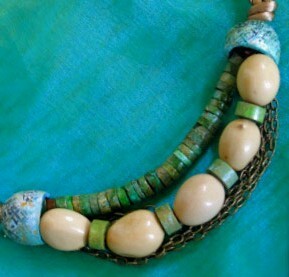 And Monday, I met a wonderful woman, who has the networking potential to help me with my jewelry work in a big way. It was such a random encounter. I wonder if it was real or a sneak peek at the dream world. Fortunately, I have her card, which appears very real indeed. I am awed by the unconditional presence of love in this world. 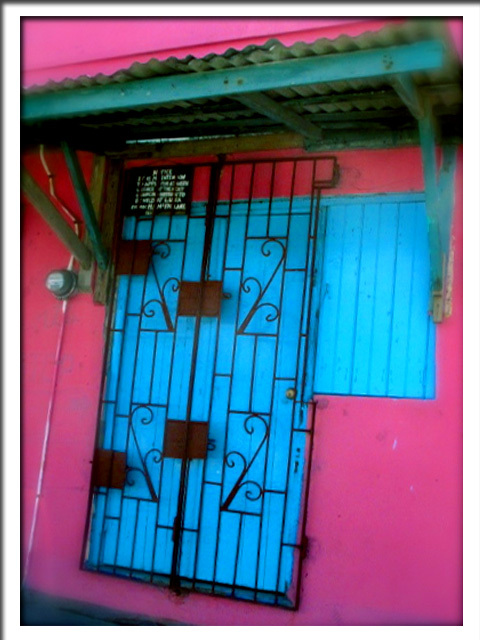 We recently accompanied a friend into one of Montego Bay’s rougher ghetto communities. The “gangsta” vibe was obvious. Early on, it was clear that several of the “idlers” hanging out in front of our destination were packing serious heat, if you know what I mean. Ironically, I didn’t feel unsafe. In addition to diplomatic immunity I tend to practice love and light, even in the darkest of places. Thus far, I am blessed. Surely, love and light prevail in desperation, and poverty? But what about in the presence of the “criminal element”? In the midst of a very busy friday, I watched several people, including one small boy (probably no older than six), line up at a dripping water pipe. As folks took turns filling their buckets and empty plastic bottles, I wondered how far each person would journey home before drinking, washing plates or bathing. Teetering somewhere between guilt and gratitude, I was instantly overwhelmed by the privilege I inherited at birth. I certainly never wanted for food, warmth, electricity, water or a safe and loving home. Let alone the common “must haves” viewed as luxury items by a large percentage of the planet’s population. Residing here in Jamaica, for nearly five years, I’ve experienced living w/out facilities that we (Americans) tend to perceive as the fundamentals of life. It has humbled me. Nonetheless, what shines through, again and again, is LOVE. Jamaica does not fall short in this department. Sitting in the passenger seat of our beat up 1991, Toyota wagon, watching folks fill and carry away their water vessels, I was humbled yet again. I looked up at the concrete building that created the little alley way where we waited for our friend. 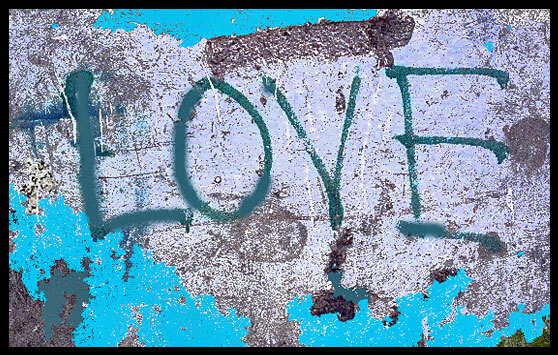 On the wall, in the middle of graffiti that spun tales of violence, desperation and tragedy, very clearly spray painted, was the word LOVE. The taggers, gangsters and artists had left it alone. LOVE in the ghetto, too sacred to mar.